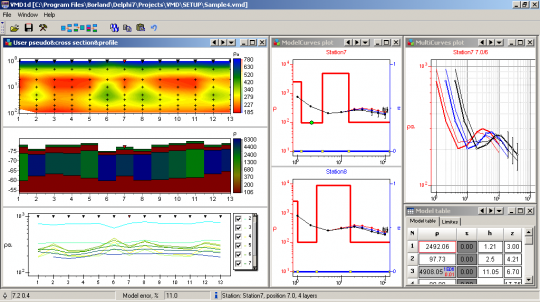 ZondVMD1D software is designed for one-dimensional interpretation of frequency-spacing soundings data with a vertical magnetic dipole (a range of frequencies 0.1-500 kHz, Hz, Hz/Hr). Method of electromagnetic sounding (EMS) is used primarily for investigation of areas with adverse for application of DC electroprospecting methods, in particular, for long-term frozen areas. Use of EMS method with not grounded source and receiver has a number of advantages vs VES. It includes uselessness of grounding, possibility of all year long field works, works from an ice surface, on sites with rocky or stony cover, deserts and dry excavations. While studying frozen rocks this method has much accuracy in researching of bed rocks and buried relief. EMS method is successfully applied for definition of: contours of buried river valleys, thawed zones, oozy and clay horizons, the top boundaries of conductivity ore bodies and also for bed rocks mapping. While making field measurements a transmitter coil (or the loop), usually fixed and the receiver moves. Next EM components can be used as measured: the relation of vertical magnetic field components to radial Hz/Hr, the relation of perpendicular electric field components to vertical magnetic component Ey/Hz and vertical magnetic field component Hz. Depth of investigation is defined by the minimum frequency and the maximum spacing of observation system. Comfortable interface and wide possibilities of data presentation allow to solve given geological problem with maximum effectiveness. While developing software special attention was payed to comfort and simplicity of its use, variety of visualization features and account of a priori data. Depending on the interpreter’s choice, software gives different variants of data interpretation algorithms. Comfortable control system allows to choose from the great number of equivalents results that will appear to be the best in geophysical and geological point of view. Conception of multi-station interpretation is basis of the ZondVMD1D software. Consequently, profile line data is considered as a reflection of geological section. It’s mean that multi-station data of profile line is whole, and not set of separated curves. Special windowed algorithms developed for interpretation of profile line data are provided in the software. But most software features can be used also during work with the separated points of EMS. You can use areal XY survey with arbitrary lines orientation in multi-line mode. ZondVMD1D support well-known format for EMS instruments. As the basic task of the program is inversion of geoelectric section parameters – few variants of inverse problem are realized in ZondVMD1D, basic of them are: smoothed inversion – to get smooth, and focusing – to get the piece-smooth distributing of geoelectric parameters vs depth. Because of equivalence of inverse geophysical problems, quality of the obtained results strongly depends on the amount of used a priori data. In ZondVMD1d there is possibility of weight setting(Error gates) for measurements, fixing and limiting of different layers parameters, using of a priori model as reference in inversion. If the values of some section parameters are known exactly (a priori or on interpretation results), their fixing is possible before the beginning of automatic interpretation. The fixed parameters do not change during the process of inversion. Fixing of parameters is the method for hard regularization of inversion process. The robust schemas of noise estimation are realized in the program.